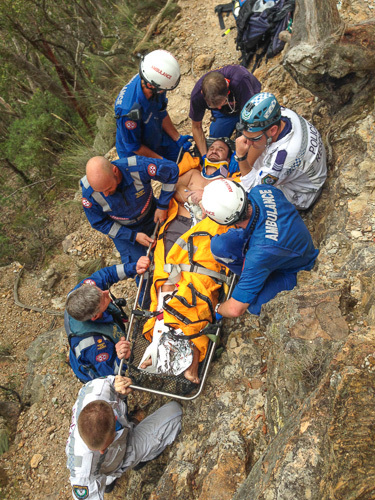 When Alex Ling fell from the top of the cliff at Mount Piddington he thought he was going to die. He fell 28 meters — unchecked — and he slammed into the ground. This is the story of Alex’s accident and how he managed to survive it — without breaking a single bone. It comes from my conversation with Alex when I visited him at home four days after the accident. It was Saturday 10th of January. Dr Alex Ling (he is a 36 year old university lecturer) and his partner were climbing at Mount Piddington in the Blue Mountains; clocking up some “trad mileage” for an upcoming trip. Alex is an experienced and proficient climber. For the first route of the day Alex led and his partner followed the 28 meter Psychopath (17), they abseiled back down, then they both climbed Eternity (17) and abseiled back down again. Then they had lunch. During lunch they formulated a plan. Alex was keen to head around the corner and have a go at onsighting The Janicepts (21), but first, before they left the area, they decided that Alex would lead Psychopath again, and this time set up a top-rope so that he could belay from below and watch his partner climb the route and perhaps offer her some tips on jamming technique. So Alex lead the 28 meter Psychopath again, for the second time that day. He placed approximately ten runners. When he got to the top he realised that it would take several minutes to set up a belay and he yelled out “safe”. His patner responded by yelling out “off-belay” and she took Alex off belay. The anchors at the top were two bolts set high a few meters back from the cliff edge. Alex had to extend the bolts with several quick draws so that there would not be too much rope drag over the edge of the cliff. Alex spent several minutes on top setting up the anchor until was happy that the rope would run through the anchor OK. 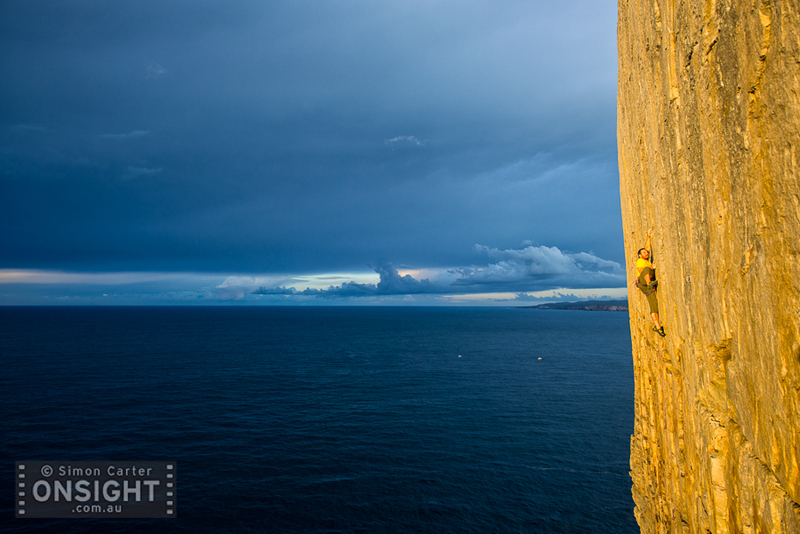 He then moved back towards the cliff edge whilst holding his end of the rope (end that went to anchor, not the end that went through the anchor to the ground). Now Alex’s memory of events is not entirely clear; it’s not entirely clear if in spending a few minutes setting up the belay he had forgotten, or maybe not fully realised, or if he had even heard, that he had been taken off belay. But in any case, as moved towards the cliff edge it seems that his intention was not be lowered down immediately; it seems that initially he was just intending to communicate with his partner. But despite extending the anchor there was still some rope drag because the rope that Alex was holding was giving a fair amount of resistance. But then the tension suddenly released. So perhaps it wasn’t just rope drag, maybe the rope was caught around something and it suddenly released. This caused Alex to lose his balance — and he fell over the edge of the 28 meter high cliff. In a moment he realised that he was not going to stop, that in fact he was going to hit the ground, and, naturally, assumed that he was going to die. The rope from Alex went up through the top belay and down through the ten runners however the friction would have done nothing (significant) to slow the fall. It may, however, have possibly have orientated Alex as he fell, because he impacted the ground back first. The fall was over in an instant. Alex smashed into the ground and he was dead. Oh wait, sorry, in fact that last bit is wrong. He wasn’t dead, he was in pain but he was very much alive. What happened is, as Alex impacted the ground he actually impacted into the exposed root protruding from a very large gum tree, growing near the base of the cliff. You can see the tree in the background in the photo below (the root is out of shot but extends to the right). The tree that Alex impacted is in the background. As Alex impacted the ground maybe an angel intervened but, what we are fairly sure of, is that Alex impacted the tree root across his shoulder blades, whilst simultaneously his hip, leg and heels hit the ground. The angle was such that it somehow span him around the tree and down onto a narrow ledge one meter below the tree. 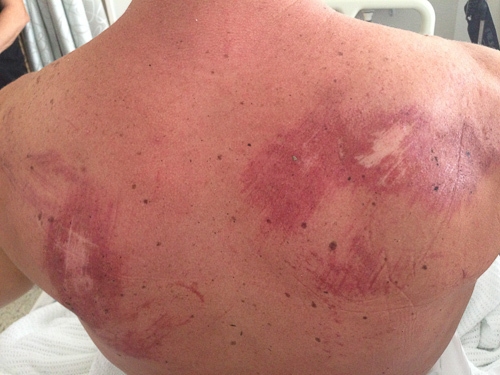 You can see where the tree root impacted Alex’s back in this photo below. 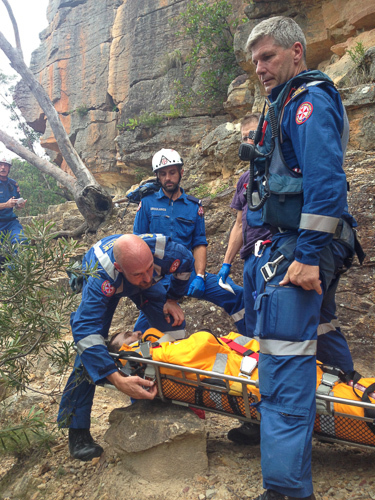 A nurse who was climbing nearby and other climbers provided initial first aid while a rescue was mounted. Ambulance and police rescue squads attended and Alex asked me to pass on his thanks and gratitude to the amazing job done by all involved. He was flown by helicopter to Liverpool Hospital Trauma Unit where, after numerous scans and x-rays, it was eventually determined that Alex had not broken one single bone. Not one. He did cop a gash to the back of his head that required four stiches and there was severe bruising to his hip, leg and heels. He was released from hospital after only three nights. Six weeks have passed since the accident and some of the bruising in Alex’s legs is yet to subside, and an infection in his ankle is yet to clear, but ya’ know, he’s on the mend! I’ve reported on accidents before and I’m very happy that this time the outcome wasn’t tragic, or particularly horrific. You may well call it a miracle. Maybe someone “up there” wanted to keep Dr Alex Ling alive; just maybe he’s destined for great(er) things. But please, don’t try this at home! Alex Ling, Shooting the Breeze (22), Windjammer Wall, Point Perpendicular. Back in June 2014. Thanks for reading my blog. Please sign up to my email newsletter and be among the first to get the news and see the new pics –> subscribe. Er, this seems to be stating the obvious but if he dropped from the top with his rope running through 10 draws, excess tail on the ground at the belayer, AND a top anchor plus some amount of rope drag leading to the anchor; enough that it (and the counter-weight of the rope) affected his orientation as he fell, he therefore experienced *very* significant resistance thanks to rope friction/weight/drag. This is definitely the reason he got off lightly. If he had fallen off the top with no draws/anchor (ala top-rope style, having failed to safety properly), chances of survival are utterly negligible. Using the splat calculator – http://www.angio.net/personal/climb/speed – if this guy experienced no friction/drag resistance due to his rope, his impact velocity would have been around 85 km/hr at that height. To put that into perspective, the chances of survival for a pedestrian hit by a vehicle travelling 50 km/hr is a mere 7%. At 57 km/hr, the average injury severity/mortality goes up by a further 50%. …So surviving an 85 km/hr deck fall? Nope. Friction saved him, there’s no way he hit the ground doing 85 AND survived with no broken bones. He more likely impacted at under 40km/hr due to rope friction/drag/counter-weight, got lucky & was wearing a helmet. Even so, that would have sucked. Hi Danzig, thanks for the comment. It’s possible rope friction did something but I don’t think it did a lot to slow him. We don’t really know. I just think he was incredibly lucky. I know someone who years ago fell closer to 40m and survived (albeit with numerous broken bones). But of course It’s very rare to survive a big fall, you have to be very very lucky! Seems to me Alex made a classic mistake, one which I see occuring time and again on the crags and that is to yell “safe” when you are claerly not, leading to the climber being taken off belay. You are not safe unless you are standing on the ground or teathered to a belay anchor. Don’t get complacent.